The Framing Warehouse have over 30 years experience in providing high quality bespoke frames. All are frames are made in-house to order and are not pre-made mass manufactured as you will see in other listings. You can therefore be assured of receiving a professionally presented finished frame that matches your exact wedding requirements. 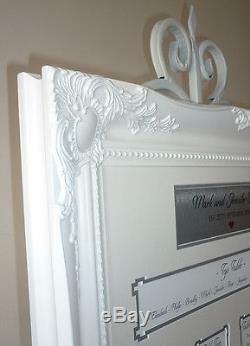 But dont just take our word for it; check our feedback to see what customers say about our Wedding Frames. This decorative WHITE/IVORY baroque style framed table seating plan is fully customisable to suit your wedding. Individual options allow you to choose your top mount colour, the colour of the trim that goes around each table list, number of tables and finally the aperture design in each cut out. The overall size is 91cm by 65cm by 4.5cm (35.5 by 25.5 by 1.5) and the frame surround is 7.5cm (3) wide. This is suitable for up to 12 tables plus a top table. There is an engraved plaque at the top with your names, heart, and under this the date of your wedding. The top table is under this followed by the individual tables. You can of course have any text on the plaques and the table lists. We use a specialised wedding font for the text. But are happy to use a font of your choice, assuming its a standard one supported by standard applications. The ordering process is very simple and please refer to the images for examples of the colour schemes/designs. Select your main Top Mount and Trim colour (choose your colour choice if your choice is not listed as we have a large selection of mount colours). Choose your number of tables (select other combination if your layout is not listed). Choose an aperture border style that goes around each cut out. Once ordered we will send you are spreadsheet so you can fill in all the required details. The frame is delivered free by courier and despatched normally within 3/5 days of receiving your guest list. Some delays may occur during the summer months. You will also need glass or plexi-glass as Wedding plans do not come with a glass covering. There is a charge for this. Should you have any special instructions please include this in the spreadsheet. We also offer the following products that may be of interest and can be viewed by clicking here. 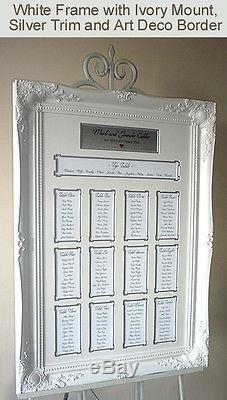 Wedding Guest Book Signing Frames A great alternative to the traditional Guest Book. 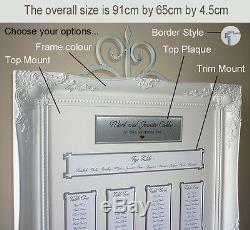 Hire of Decorative Easels to display the your Table Plan and Wedding Guest Book Frames. Hire of Wedding Seating Plan Frames. Mount only Wedding Seating Plans. A superb Wedding Gift and keepsake that you will not be disappointed with! 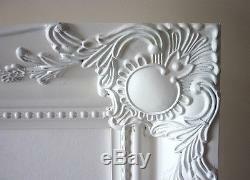 L'item "White Luxury Wedding Seating Plan Frame Large Baroque style Customisable" est en vente depuis le mercredi 5 mars 2014. Il est dans la catégorie "Home, Furniture & DIY\Wedding Supplies\Other Wedding Supplies". Le vendeur est "spiritofsport" et est localisé à/en Reading. Cet article peut être livré partout dans le monde.